The Travelling Fantasy Round Table: Part 1: What's Fantasy For? If you're interested in unpicking the bones of fantasy, check out Part 1 of the Travelling Fantasy Round Table, a series of discussions I'm contributing to which will be delving into some of the whys and wherefores of the fantasy genre. Part 1 takes us broadly into the genre, asking "What's Fantasy For?" and has contributions from Sylvia Kelso, Theresa Crater, me, Carole McDonnell, Warren Rochelle and Deborah J Ross. Future discussions will delve into gender, sexuality, language, and all sorts of fun questions behind the books we read and love. Come join in the discussion! 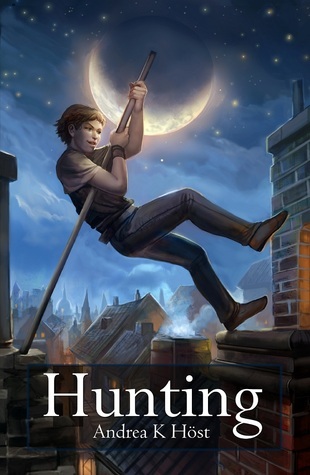 I've added a giveaway for "Hunting" over at Goodreads. The end date for the giveaway is in December, but I'll bring it forward to the release date when I know what the release date is. Once I've finished this draft of "And All the Stars" (which is only 14,000 words along) I'll be switching to the near-final draft of "Hunting". It won't be a simple clean revise since I have some worldbuilding changes to implement, but "Hunting" is the one book I'm fairly sure of putting out this year, with AAtS being a 'probably'. Giveaway ends December 02, 2012. After spending a year revising and publishing already written novels, it's an interesting shift for me to go back to 'fresh' writing. I'm what's known as a 'discovery writer', meaning I start with a situation or concept, create a character, and 'discover' more about the story by writing it (as opposed to those who write a plot outline of some description before beginning the draft). Discovery writers and outliners are not so very different as some may assume. While I don't write an outline, or plan the book before I start writing, I usually have a very good idea of where the story will end up by the time I've written a chapter or two. Not committing an outline to paper doesn't mean I don't think ahead to where the story is going, though it does mean perhaps more changes (particularly in early chapters) than would occur if I wrote out a detailed plan beforehand. With And All the Stars, I started with a statement (after a discussion with two readers) that I don't write post-apocalyptic or survivalist fiction - which immediately led me to wonder what I would write if I did write such a thing. I do like watching apocalyptic/survivalist movies - I'm always fascinated by the disaster itself, and discovering what happened, the spectacle of the more dramatic ones, and then the adjustment stage, the figuring out how to supply basic needs when x and y are no longer available, the shifting of rules, the new dangers and the sharpening of old dangers. However, many of these stories turn into psycho-dramas of 'good person' facing off against 'evil dictator', or everyone becoming gradually nastier and more compromised by the situation they're stuck living through, which is generally not a story I'm interested in, so it's rare that I like the ending of apocalyptic/survivalist stories. I decided I wanted to start with what seemed like an alien invasion - the sudden appearance of enormous towers in cities around the world - and the immediate consequences of that for my protagonist, less interested in the alien invasion than she is in not being trapped under rubble. Initially the rubble was Centrepoint, but I moved it to St James Station because the purpose of the towers is not destroying infrastructure, so all the arrivals are in parks and golf courses (St James Station is under Hyde Park). My idea for the main character began with "curly-haired Australian girl" - because I've never written a curly-haired character before and think they're under-represented (I had to ask a curly-haired co-worker lots of questions about living with curly hair :) ). Very unusually, I then began trawling stock photo sites for photos of curly haired girls to use for the cover, since I was planning to use a photograph rather than painted art for this cover (photos are a better mental fit for current-day disaster stories than painted art). I came across a very striking photo of a green-eyed girl with very frizzy/curly hair. She was nothing like the girl I was thinking of, but I was so captured by the image that my main character became a skinny very serious wanna-be professional artist instead of a short, sarcastic sporty girl. I am definitely not a "quickly write a first draft and then come back and edit" person. I polish and edit and think about pace and structure all the way through, and will get hung up for long patches on finding the exact word or phrase, and whenever I sit down to write I will usually re-read the entirety of the current chapter. At times I will re-read through from the beginning, but it's more usual for me to be able to move on from a chapter once I've a first draft of it (jumping back only to edit in details and remove contradictions). It took two chapters to get my artist out of St James Station, but three chapters of writing, because the first draft of chapter two included a rescue of a trapped woman and her daughter. Since Madeleine would never meet this woman again, and I didn't want to introduce the other main characters at that stage, I promptly deleted large parts of chapter two and rewrote it - the rescue was interesting, but served no overall purpose to the main story. By this stage I knew who the four other main characters would be (Noi, Nash, Pan and Fisher), had worked out where Tyler was (and his function), and had a rough idea of events up to the two-thirds point of the novel (to the chapter where all my readers will want to kill me). When I'm thinking about later chapters while drafting earlier ones, I will sometimes create a file called 'Later' to store character names and fragments of conversation which I've been thinking about, which I can grab and use (or discard) when I reach the relevant chapters. Once I'm past the very beginning of the novel I can usually 'see' the landmarks of the whole book - not just to the big reveal point, but how things wrap up in the remaining third of the novel - where, to some degree, the characters have a chance to act rather than react to their situation. Certainly not every conversation or event, but the pivotal moments. Even theme is starting to emerge. By the time I reach the end of a first draft, it's usually structurally nine-tenths there. At that point I'll put the draft away for several weeks/months and go write something else, and come back to the draft 'fresh', better able to polish clumsy phrases, pick up typos, measure pacing issues, and subtly emphasise the theme(s). On the whole, I find the editing much easier than the initial drafting, but there is some pure pleasure in first drafts. Being able to finally write That Scene is a particular one for me. The scene I've been thinking about since halfway though chapter one, the one where readers will shriek and gnash their teeth, or laugh, or gape with wonder and disbelief. Reaching That Scene is a major motivation for getting through a first draft for me, though I still have a lot of fun along the way.